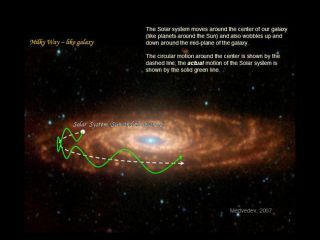 As the sun orbits around the center of the Milky Way, it bobs up and down relative to the plane of the galactic disk. Every 64 million years, our solar system pops above the "northern" edge of the disk, exposing Earth to a barrage of dangerous cosmic rays that may be affecting biodiversity on the planet. So what's in store for Earth in the near future? The solar system is on the upswing now, bobbing toward the northern edge of the galactic disk. But big increases in cosmic-ray exposure are probably still about 10 million years off, researchers have said.